In Portland, Oregon’s largest city and second largest in the Pacific Northwest, visitors discover the best of both worlds: the excitement and variety of big city life with the friendly charm of small town America. Maybe that is part of the reason Portland has been called one of the U.S.A.’s “most livable cities.” Tall buildings and restful green spaces comprise the downtown core, with Waterfront Park stretching along the Willamette River and Forest Park framing the west hills. Biking and walking are popular modes of travel, but for those who want to see more in a short time, Portland’s transportation system makes getting around town a dream. With light rail and bus lines free in the downtown area, you can get off and on as the spirit moves you, even crossing the Willamette River to shop at Lloyd Center, one of Oregon’s largest Malls, without paying a cent! For those interested in boutiques, galleries and fine dining, just step back in time and catch one of the city’s old fashioned streetcars that connects downtown to the waterfront and NW Pearl District. If you have some free time and want to venture outside the city, drive an hour or two in any direction and you can find yourself walking along the shore of the Pacific Ocean, climbing majestic Mount Hood, driving through dense Douglas Fir forests, watching cascading water at Multnomah Falls or sampling the rich bounty of Willamette Valley’s rich wine country. 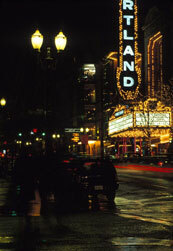 To learn more about Portland, the City of Roses, visit Portland Visitors Association, www.travelportland.com. With so much to see and do, you’ll be glad you came!